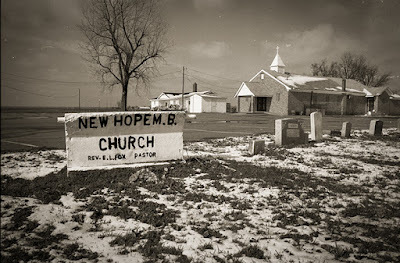 But finding New Hope Baptist Church out from this small Delta town within shouting distance of Memphis is not hard. Crossing the railroad tracks off Highway 61 on a meandering blacktop road where dusty soybeans are being cut, we stop for directions. Two men are working on a broken-down combine. It's Sunday church time in Southern Baptist country. But on sunny October mornings, even preachers excuse their absences. Nothing's more urgent in the Delta than getting a crop out of the field before rain sets in. Pointing down the road, one of the men says, "Just go on up to the next sign, and turn right." New Hope would be difficult to miss...Hardly a neglected frame chapel, the sturdy brick building sat next to a tree-shaded cemetery, and it exuded solid dignity. Inside its paneled walls, an elevated pulpit reigns in the carpeted sanctuary; pews are softened by cushions. "This is my roots; I am the son of a plantation sharecropper," informed Deacon Herbert Brown. The formalities occurred inside the church; the recognition of ministers present; reading of scripture; the official remarks of biographer Paul Garon; and the lip service given about a recognition being "past due." He welcomed a "congregation of great diversity assembled to honor a church member buried in the graveyard outside." Her name was Lizzie "Kid" Douglas Lawlers. 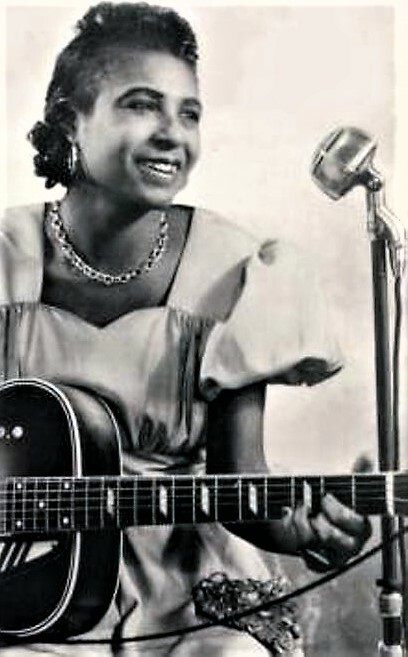 To the world she is known as "Memphis Minnie." She died in 1973. Twenty-three years later and Skip Henderson explains how the Mt. Zion Memorial Fund was founded with the help of superstars John Fogerty and Bonnie Raitt, each of whose music was indebted to Mississippi's blues masters. 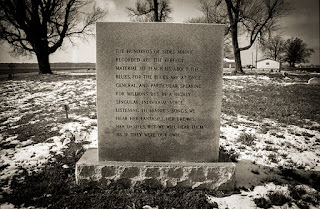 In their lifetime, few found recognition; some got promises and paltry recording fees; many lie buried in isolated cemeteries in unmarked graves. Eulogizing blues musicians inside churches where their life-styles were rarely admired presents a diplomatic stretch for preachers and kin. But inside New Hope Church a spirit of generosity and appreciation prevails. "You didn't ask me here to preach," commented the principal surviving women in Minnie's family. "Nobody knew what happened from the attic to the basement." With a take-charge air of authority, Sister Daisy Douglas Turner, Minnie's niece, alluded to her aunt's free spirit. Testimonials were heard from Minnie's oldest sister-in-law, Ethel B. Douglas (married to Minnie's brother) who said she "was on to Minnie's ways," and from Daisy Douglas Johnson, her oldest living relative. Mrs. Johnson is Minnie's sister, the youngest of 13 Douglas children. The preacher softened an earlier remark about Minnie's tribute being past due. "Perhaps it's not late; but just the season." "Let us honor one who gave to so many through music." - "Give honor to whom honor is due." Giving visible testimony to Minnie's contributions was the large congregation. Taking turns to stand and identify themselves, they become known as relatives and friends, biographers, photographers, television and print journalists, historians, corporate and recording executives, and blues fans from Europe, New 'York, Seattle, California, Memphis and many sections of Mississippi. "An offering is lifted," as the congregation files past the collection plate pastor Roger Brown and respectfully adjourns outside for the monument unveiling. 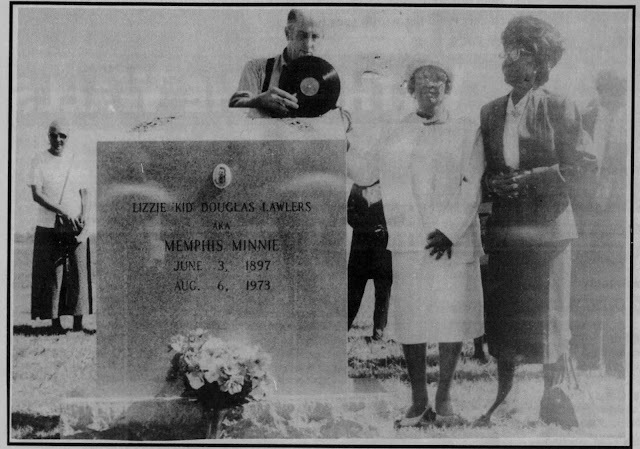 Posing for an official dedication photo following the unveiling are (from left) Memphis Minnie's biographer Paul Garon holding a recording of the singer's works which are being re-issued by B&G Records represented at the ceremony by Vince Caro and family of New York; her sister and oldest living relative Daisy Douglas Johnson and her sister-in-law, Ethel B. Douglas. 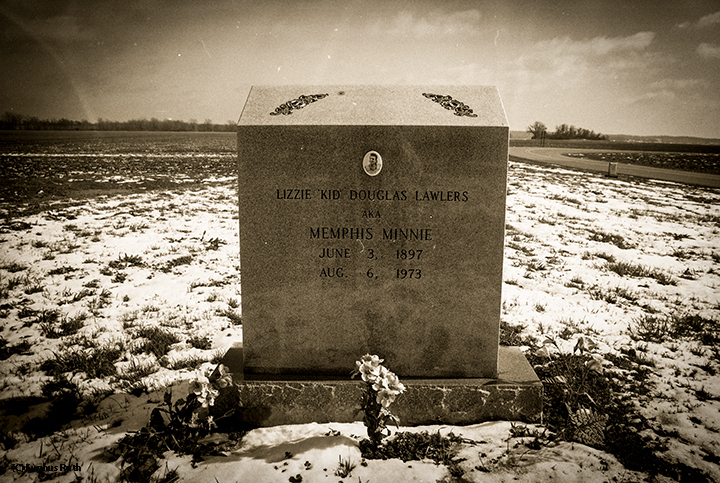 Lizzie Lawlars [famously known as Memphis Minnie] as well as her husband, Ernest Lawlars, who recorded under the name "Lil' Son Joe," were buried in the New Hope Baptist Church Cemetery in Walls, Mississippi. The small, rural town sits about twenty minutes due south from Beale Street on Highway 61. The headstone memorial unveiling took place on the morning of October, 13th, 1996 in beautiful fall sunshine and was recorded for radio presentation by the BBC of London. The ceremony was attended by over 90 people including Minnie’s sister Daisy and 33 members of the extended Douglas family, many of whom had no idea of their relative’s powerful musical legacy. Bonnie Raitt financed the memorial stone which bears engraved roses and a ceramic cameo portrait. “The hundreds of sides Minnie recorded are the perfect material to teach us about the blues. For the blues are at once general, and particular, speaking for millions, but in a highly singular, individual voice. Listening to Minnie’s songs we hear her fantasies, her dreams, her desires, but we will hear them as if they were our own." Blues-L member William Morgan reported, “This was a truly extraordinary event, and so much of the credit…should go to Skip Henderson of the Mt. Zion Memorial Fund, which has now been responsible for nine such monuments [and] goes much further than the placing of a headstone” in honor of Memphis Minnie, who died in 1973 and lay buried in an unmarked grave." 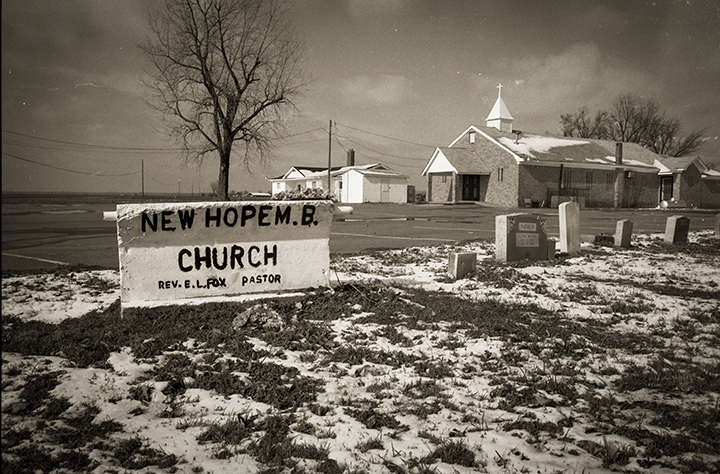 All of the pink paper signs on every immobile object in the small hamlet of Walls, Mississippi, guided an estimated one hundred people to the “typically tiny” New Hope Baptist Church, which sits about a mile west of the gas station on Highway 61. The crowd found the large, beveled stone at the eastern edge of the burial ground, draped with a bedsheet. As many as half of the people in attendance, Morgan believed, were relatives of Minnie, including the blues artists’ youngest sister, the last surviving of eleven siblings, and her daughter-in-law, with whom Minnie spent her final days. The church minister was as cordial as could be and could not have had less concern for the ragged appearance of some folks and invited them over to the ceremony, which started promptly at noon. Respect & Solicitation for "Son"
Detroit Free Press, July 13, 1997. 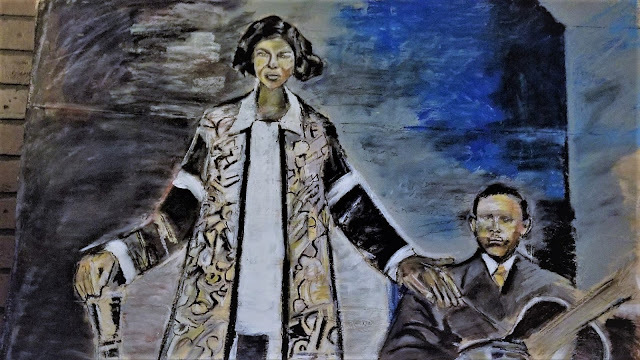 One of the editors of Detroit Blues magazine sought advice from founder Skip Henderson while attending the dedication in honor of Memphis Minnie. 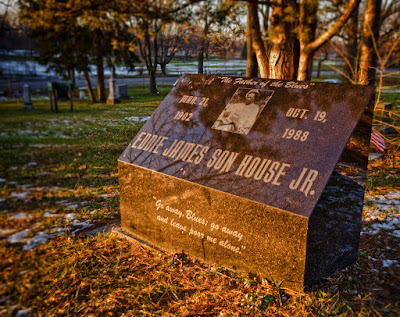 The Detroit Blues Society and the Son House Memorial Trust Fund in 1995 wanted to #1) adopt the existing park at the corner of Clarita and Lahser, adjacent to Mt. 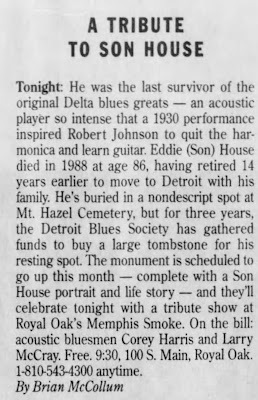 Hazel Cemetery, and #2) change its name to Son House Memorial Park, and #3) erect a gazebo, a statue, and a memorial plaque outlining the particularly notable contributions of the Mississippi blues shouter. Henderson answered “many questions” concerning the erection of memorials for blues musicians, and he enlightened them as to the real costs of erecting a “fitting memorial in line with the other such memorials,” and schooled them on “all the legal ramifications” of such an ordeal. 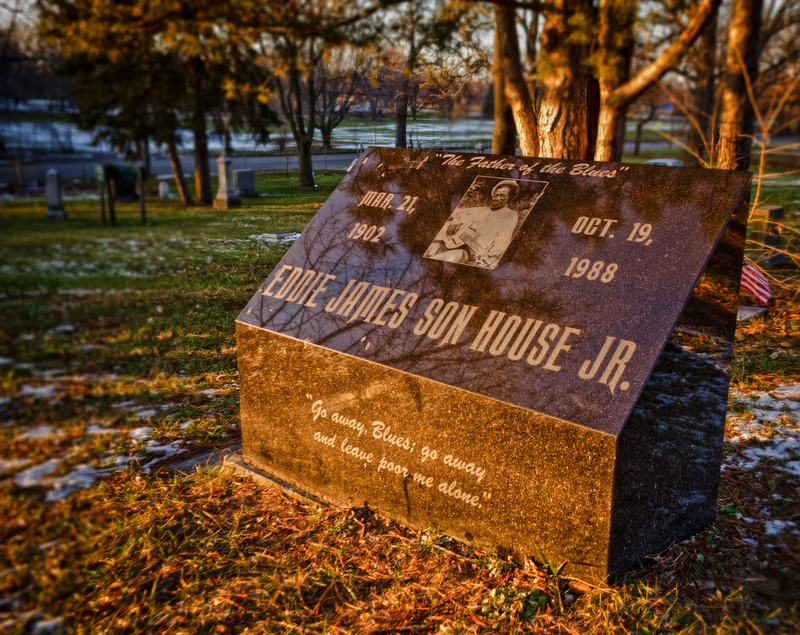 The blues writers and members of the Detroit Blues Society returned to Michigan and immediately started raising money to mark the grave of “Son” House. The other elements of the tribute fell away in the harsh spotlight of municipal politics and the reality of cemetery and property law. Wayne Pritchard, of Simpson Granite--a music lover and responsible for the erection of the Nolan Strong Memorial dedicated on November 24, 1996—offered up his experience on the project. Son House was buried in an unmarked grave at Mt. Hazel Cemetery in October 1988. “We have found ‘what’ we are going to erect,” they informed, “now we must find ‘where.’” Most folks didn't know exactly where the blues singer had been laid to rest. 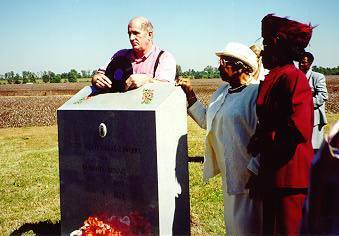 A headstone was erected for Son House in the summer of 1997. 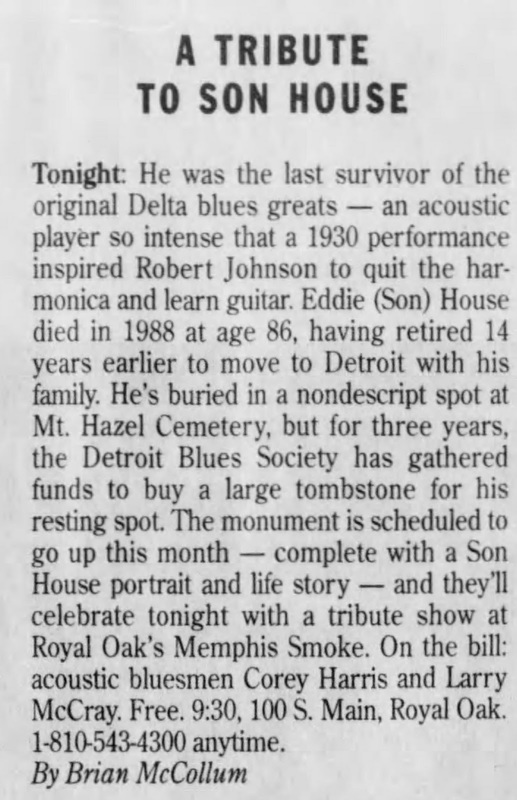 The Detroit (MI) Free Press, Oct 11, 1995, p.7C. “Blues Editorial,” Detroit Blues 2:4 (Winter 1996-97): 5-6.